The cover I received is actually not terrible given the speculation that the entire Udder Cover enterprise was a scam. The fabric is cute and I love the stiff collar that allows mom to maintain eye-contact with their baby while feeding without feeling exposed. Of course, if someone is standing right over you, staring down your shirt, they'll see baby on your breast, which is true with all nursing covers that allow eye-contact. The fabric is thin, but not see-through and, while pretty substantial in size, it can be folded up really tiny to fit into your diaper bag. 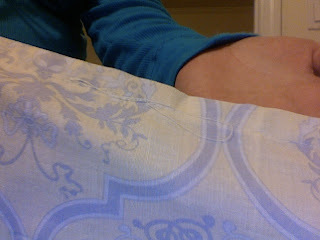 The sewing is a little shoddy, though, which bothers me. (Couldn't the Udder Cover folks stop their frantic sewing just for an instance to fix a simple stitch?) 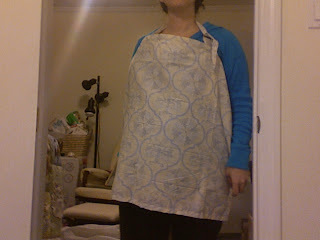 That said, I'm pretty sure that the cover will hold up... unless I'm doing some wild, acrobatic breastfeeding! So, is the Udder Cover worth the $8.95 ? For me, I think so. I definitely could have sewn a similar cover myself for less money, but I'm SO not in the mood these days to head out to the craft store for all the fabric and hardware. Also, all of the comparable nursing covers I have seen begin at $20 and up, so I'm pretty happy to have paid half price, shoddy sewing and all. I guess my biggest problem is, however, that Udder Covers offers these "special" codes in perpetuity. (I just received another code in an email today.) I'm certain the "pay S&H only" deal is a great marketing ploy they read about in a book and is indeed bringing them a lot of business--I mean, we all jump on buying something that is "free"--but I think the company would garner more goodwill if they would just sell the darn thing for $6 with $2.95 S&H. As it stands, we all jump on the deal, realize after the fact that it isn't really special at all, and start suspecting that something fishy is up with the company. Udder Covers, we'd respect you and your product more if you'd just give it to us straight! I ordered an udder cover for my daughter back at the beginning of September, I have yet to receive it. Every time I look they move out the ship date. It is always on back order. If you go to their website, most are on back order. I understand back orders but, you should deliver your product in a timely manner. My daughter is due in 5 weeks and I may not have what I ordered 3 months ago.